Even though women are not dressing (only) for guys- we still somehow want the man to find our style or outfit attractive. At least a little bit. 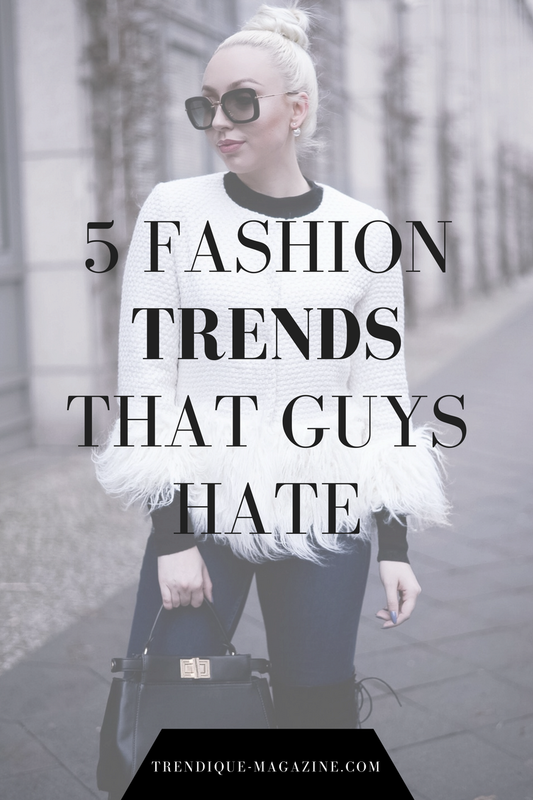 Continue reading to find out 5 fashion trends that guys hate on women. I have never heard about one men who likes culottes. Like seriously- have you ever met one? I think these pants are simply unattractive to any men. They are really high fashion and such a big trend piece, but at the same time not really flattering. Girls LOVE Ugg boots but unfortunately guys seem to really hate them. They find them to be the most ugliest shoes ever... I personally have only met one guy who thinks Ugg boots are cool. This is a point I can somehow understand. A trendy oversized hat can easily look a bit too much and guys can't really see the girls face. If the guy is not really into fashion and trends he's probably going to hate oversized long coats. Maybe it's because a oversized coat which goes all the way down to the ground gives this super extravagant and sophisticated feeling. There's probably not one single female who hates high waisted jeans. Well, sad new ladies... Guys seem to really hate them! They think it makes the bum look flat and simply unflattering. Its basically all about trendy fashion and that is what women bother the most which is a good thing because fashion should be the one that is in trends.